‘Bright’ is the latest Netflix Original movie that stars Will Smith as a police officer. It’s not the first time Smith has done a police officer’s role. But it is the first time he’s accompanied by an Orc. Released late in December, Netflix’s “Bright” has brought quite a bit of controversy upon itself. On one side, the majority of the critics have bashed the movie with negativity. On the other side, plenty of comments left on websites and Facebook’s comment sections show that a good number of the audience has actually liked the movie for what it is. For me, I went in with high expectations because of Will Smith. I was disappointed. But I don’t regret watching the movie. It was anything but a waste of time. I was bothered by sloppy acting, bad writing, dialogues that felt out of place, and an ending that didn’t make a lot of sense. Still, I had a good time watching the movie. In my book, ‘Bright’ is one of those movies that aren’t tagged as ‘must-watch,’ but if you’re free on the weekend, and if you can put aside your inner judge, you’ll like the movie. As with anything in the arts and entertainment, whether the movie is good or bad is purely a subjective question. So, the viewers who loved this movie will naturally not agree with me that it went wrong anywhere. With respects to those viewers, I do think that Bright went wrong in quite a few places. First, it failed to communicate what the world is where the events are taking place. I’m all for suspense which drops us into a world and then lets the narrative take care of the unfolding. However, Bright did not do a good job at it. Even Netflix itself believes that the movie needs some backstory which they have released recently on YouTube. You should only watch it if you’ve already watched the movie. Then there’s the bad acting. Will did a good job as usual. But everyone else’s acting felt over the top yet underwhelming. I haven’t seen any Orc as a police officer on the screen before, so I have nothing to compare the performance of Joel Edgerton as the Orc against, but I think he did a good job playing the character conveying his desperate will of proving his worth to the world and getting acceptance in his own community of Orcs. The dialogues are also super cheesy and often felt unnecessary. “Fairy lives don’t matter today” stands out from the entire movie. What does that even mean? Is this supposed to be something a White racist person would say in a real-world situation if he could? How is this even relevant to the movie where fairies don’t really play any vital role to the rest of the movie at all? Interestingly, where Bright shines is not the movie itself, but on people’s reaction to it. As said before, arts and entertainment are purely subjective. What one can find breathtakingly beautiful work of art, others can find the same thing utterly useless. Sadly, when you go to IMDb or Rotten Tomatoes or Metacritic, you do not see both. You see a single rating, a single percentage of that is supposed to give you the idea of how ‘watchable’ or ‘good’ a movie is. Truth is, it doesn’t convey an accurate idea, not anymore. Especially with the practice of ‘review bombing’ around, the ratings and scores are inaccurate now more than ever. Take the following screenshot for example. Taken at the time of this writing, you can see that the Metacritic shows a Metascore of 29 above the fold that says “Generally unfavorable reviews based on 26 critics.” You would think that the movie is utterly useless based on that number alone. However, if you scroll down a bit, which I doubt most people do, you’ll see the stark contrast between Metascore which is based on critics’ reviews and User Score which is based on users’ reviews. The movie has already sparked numerous discussions on websites and Facebook about whether it’s worth watching. A quick look through any of such comment section shines on the fact that there will always be opposing views when it comes to entertainment. One group will like a movie, another group will hate it. A third group will criticize it constructively while a fourth group will defend it like it’s the best movie they’ve ever seen. I think we all need to agree that different people react differently to the same movie, and we need to stop using ratings and scores as the first mean to decide if we’re going to watch a movie. I have watched plenty of movies with bad ratings that I’ve thoroughly enjoyed. I’ve also seen my share of overrated movies which shall be left unnamed to avoid starting a fan war. 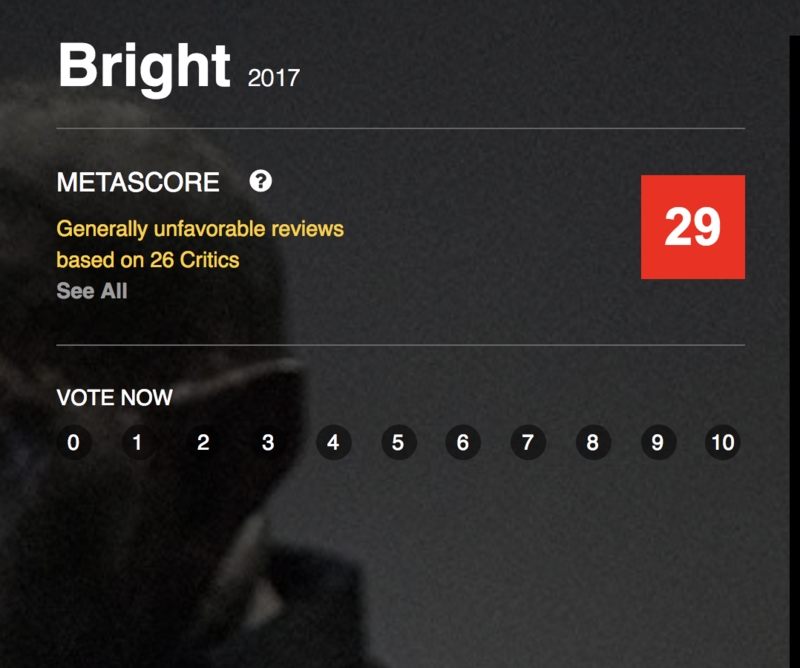 If someone went ahead to see the ratings and scores of Bright without reading any of the articles written about it, what do you think they will decide based on the scores they see online? Pretty sure that they will skip on the movie which they might have enjoyed otherwise. Thanks to the ongoing discussions, “Bright” has managed to shine a bright light on the fact that we should all take those ratings and scores — and reviews as well — with as big a grain of salt as we possibly can. Have you watched Bright yet? What are your thoughts on the movie? Let me know in the comments! Seen the movie few days back. There were so many plot holes and the ending was a bad wrap up done in unnecessary rush. But the way Netflix portrayed this universe has me super interested into these clan structures and I wish they keep making more movies on this. Good Read. Appreciate the post. Thanks for your comment! I agree, the universe is super interesting and the potential for a successful franchise if done correctly. In the right hands, the premises of Bright can shine upon itself! I really like the way you write. How can I learn this?